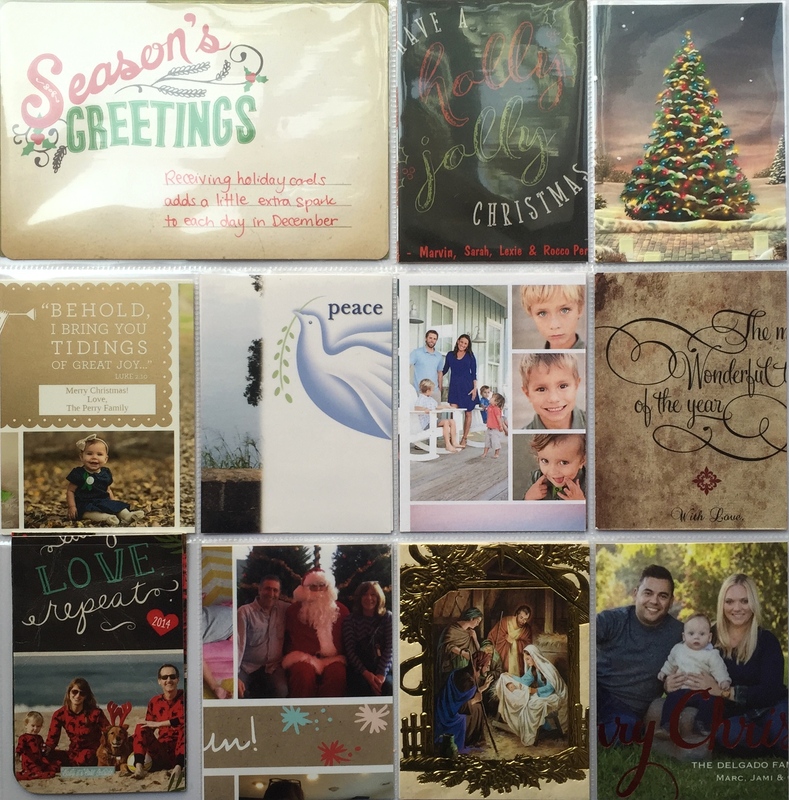 Holiday Album Part 2 | What to do with all those Holiday Cards? 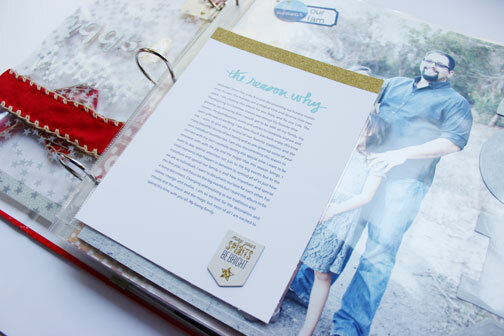 In Friday’s post, I shared that I was working on finishing our Holiday scrapbook album. I wanted to have it done by Easter. I was so set on trying to reach that goal that after the girls found their baskets on Sunday morning I got to work on a couple more pages before we left for the big family gathering in the afternoon. Happy to say that while I didn’t finish it by Easter (I was WAY too tired when we got home to work on it anymore), I did finish on Monday, just one day late! It feels so great to have a complete album and a record of one year of our Thanksgiving to Christmas holiday memories. One thing I included in the album that wasn’t in the original plan was a page for our Holiday Cards. Getting holiday cards in the mail during the month of December is one of my very favorite things. I love seeing postmarks from friends and family all over the country and internationally and showing the cards to the girls. As much as I love getting them I never know what to do with them at the end of the season. As much as I would love to keep every card we get it’s just not realistic so after cherishing them all season I usually end up throwing them away. This year though, I hesitated, and as I was taking our holiday decorations I set the cards aside on my office desk. To get ready for The Finishing Project class I did a big cleanup in the office and ran across the cards and thought in the back of my head that I wanted to somehow incorporate them into our Holiday album. Still not sure of how, I put them with my holiday album supplies. I ended up incorporating quite a few pocket pages into the album. As I was looking through the different pocket page designs I realized I could fit a bunch of holiday cards in by using the Project Life Design F photo pocket page. So I cut each card down into 3×4. For photo cards I tried to include a family picture for the front plus the name of the family for the back. For traditional cards I included a pretty section of the card front plus the signature and sentiment from the sender for the back. 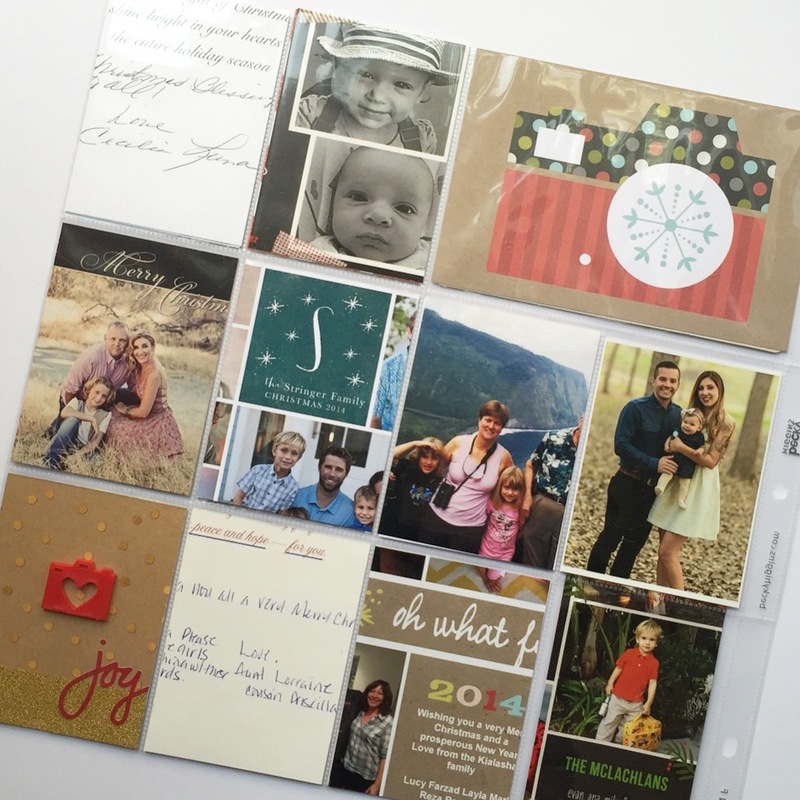 Using this method I was able to include all of the cards we received this year in our album. A great little snapshot to look back on each year. Even if you don’t keep a holiday scrapbook but want to be able to look back at your cards you could create a Holiday Card album instead. Just add to the album each year. It would be a great way to see how your friends and family have changed over the years. 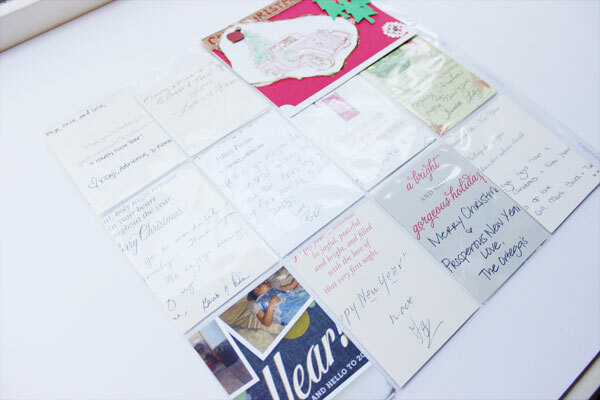 I found a couple other interesting ideas on what to do with your much-loved holiday cards. Keep these tips in mind for the end of the year. You could create a cute little minibook with just a hole punch, a binder ring, and some scrapbook paper to create a cover with the year on it. Put those minibooks out in a basket each year as part of your holiday decor. For non-photo holiday cards you could send them into St. Jude’s Ranch for Children. They have a recycled card program where they repurpose the front of greeting cards by attaching a new back and selling card bundles. They accept all-occasion greeting cards year-round. So keep them in mind after your next birthday party too. 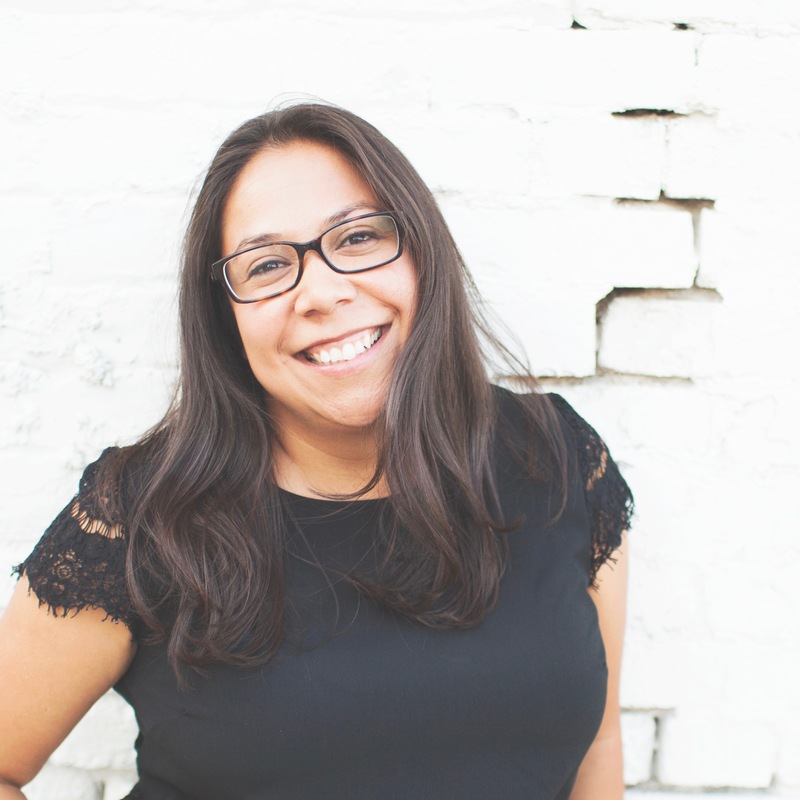 Even though Christmas is a long way off I hope I was able to give you a couple of ideas for documenting your own holiday season and possibly a way to reuse or save those beautiful holiday cards. I am grateful for the time you’ve spent here. Thank you for sharing this moment with me! 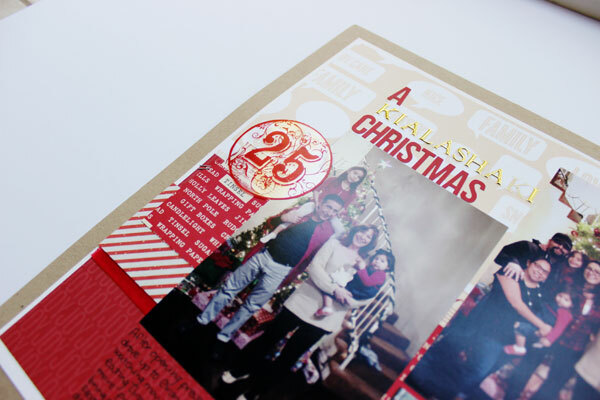 I’m happy to see we’re on your xmas cards layout – yay! Also, thanks for the great tip on sending the cards tothe recycled cards program. 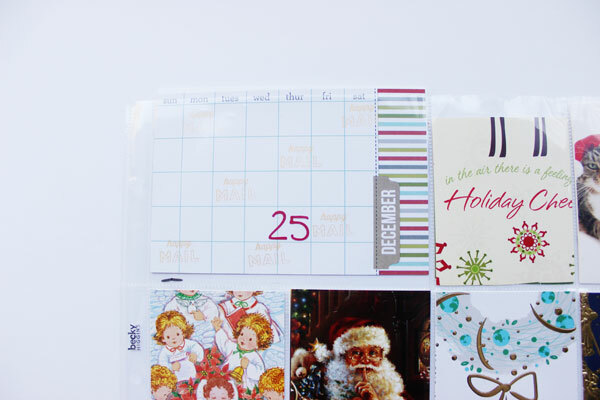 I love these tips for preserving holiday cards. I tossed my 2013 holiday cards because I didn’t know what to do with them, and I regretted it later. I kept the cards from 2014, but they are not very fun, just sitting there in a pile in a drawer. Another idea I read about was hole punching the corner of each card and putting them together on a binder ring, with your own family card on top to remind you of what year it is. That way you can display them each year by hanging the ring somewhere, maybe on your tree or a card display. This is a lovely idea. It would be fun to have a whole album of Christmas cards and see how everyone’s families grow and change throughout the years! Thank you Naomi! It is a really lovely way to keep your holiday cards to look back on. I did this for the first time this past December and am so glad! We have already enjoyed the cards a lot more than in past years when they disappear into a shoebox after the season.